After the ‘Tampa Affair’ off the coast of Australia, the Australian government reached an agreement with Nauru (population 10,000) in 2001 to institute a detention centre on the world’s smallest island state. Once established, the camp’s tents were soon overcrowded and there was a shortage of water. Slowly it was revealed that, overwhelmingly, those who had come by boat were not “queue jumpers” or criminals or terrorists (a claim regularly made by ministers, despite being refuted by the government’s own national security chief) but rather people fleeing genuine persecution and who were owed protection. As a result, most were resettled, predominantly in Australia. The Nauru detention scheme concluded in 2007 with Australia at one point paying for the massive bureaucracy of an entire incarceration centre housing just two Iraqi men, both of whom were found to be refugees who subsequently resettled. In 2012, though, the then Labor government saw fit to reinstate detention on Nauru and subsequent governments have persisted with the policy. With phosphate mining at the centre of their economy and resources likely to run out in the near future, it’s understandable that alternative sources of revenue must be explored. So when the offer from the Australian government came to establish a Regional Processing Centre on the island – along with a significant financial boost to the host country – it wasn’t insignificant that “by 2007, revenues generated by the processing centre amounted to around a fifth of the country’s GDP.” After the re-opening of the facility in 2012 under Australia’s Gillard government, by 2013 it was employing some 600 Nauruans and was “after the government, the largest employer in the country“. A country with a population of 100,000 in this situation doesn’t have the alternatives available to nations like Australia as regards development of industries and earning opportunities to sustain its people in the short-term, let alone indefinitely. So the ongoing functioning of Australia’s offshore processing operation is a very different issue to the government of Nauru than it is to the Australian government (for whom the policy is one markedly more expensive to the Australian population than processing people seeking asylum on home soil would be). Since the 2012 re-operation began, information on conditions has become extremely challenging to access with journalists requiring $8000 media visas to visit the island, applications for which frequently receive no response. So it is the detainees who do what they can to communicate the horrors to which they are subjected. One young man – proven to be a genuine refugee – took the drastic step of self-immolation to draw attention to the plight of the detainees. Omid Masoumali burnt to death. 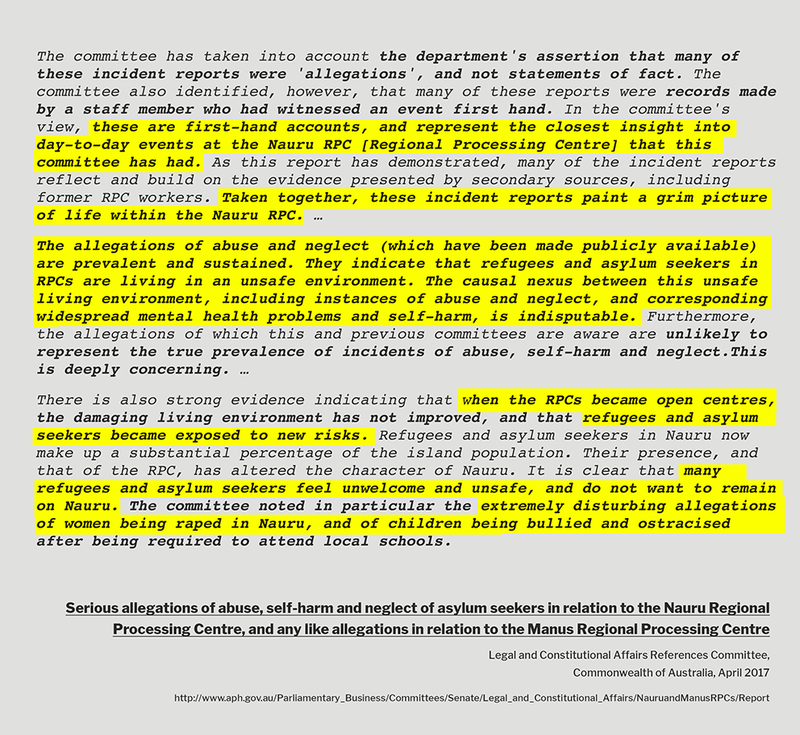 Also in 2016, 2,000+ leaked incident reports from the Nauru Detention Centre laid bare the devastating trauma and abuse inflicted on those held by Australia in offshore detention. Over 51% of the formally reported incidents involved children, even though children make up only 18% of individuals held. As reported by the Guardian, the assaults, sexual abuse, self-harm attempts, child abuse and horrific living conditions endured by asylum seekers painted ‘a picture of routine dysfunction and cruelty‘. “There are some that are legitimate and there are others that aren’t, and others that have been found not to be substantiated. So the Australian government’s OWN Senate Inquiry has underlined that the leaked reports are likely to be just the tip of the iceberg (in direct contrast to the denigrating statements of the Minister for Immigration and Border Protection). Despite the damning bipartisan conclusions, however, no action whatsoever has been taken either reduce the risk of abuse, harm and squalor to which asylum seekers continue to be subjected on Nauru OR take steps to alter the offshore detention policy that has been so broadly condemned globally by those at the most influential levels of human rights law. We have been imprisoned for four years on Nauru. We are punished for our patience and good will. If Australia won’t take us, we accept that. Let us go to a country who wants us. New Zealand wants us. Let us go there, so we can be good loyal citizens and contribute to the community and build our future. We are good people. We just want freedom in a country where we belong. …. We are human, we want to be responsible for our own lives. We cannot take this anymore, the lies and false promises are killing us and destroying our minds and souls. People are still living like animals in the camps. The conditions have made everyone sick. The mould is toxic and dangerous. … We were promised safe accommodation in the community when we became refugees. …We are not free! We live under strict, high security detention control, robbed of our civil liberties because you have no where else for us to live. … You leave us to rot, with no information, with no hope, with no future and with no freedom! We formally request that we be EVALUATED NOW! Please give us amnesty and let us go to New Zealand. Let the separated families reunite and please have some compassion for us. It should be noted that the resettlement deal with the United States was thrown into doubt even before the revelations of the conversations between leaders Trump and Turnbull (described on the ‘Read’ page) when, in July 2017, US officials who has been interviewing asylum seekers on Nauru halted screening procedures and departed the island two weeks ahead of scheduled and a day after Washington said the US had reached its annual refugee intake cap. And 10 months after the deal was struck, still no one had been accepted to go to the US. So detainees’ ongoing uncertainty is regularly compounded by government strategies and processes that are clearly not focussed on the needs of those who leave their country of origin due to persecution and who are, under the UN Convention & Protocol relating to the Status of Refugees, “entitled to special protection on account of their position”. From 27 September 2017, small numbers of refugees held on Nauru were accepted for resettlement by the United States. The Guardian reported that 27 people from Nauru would be settled various states which included Georgia, Oregon, Colorado, Texas and Arizona and that they would be assisted with housing, physical and mental healthcare, English lessons, enrolment of children in schools, and in finding employment. On 15 December 2017, another approximately 130 people from Nauru were accepted. However President Trump’s Presidential Proclamation 9645 was fully implemented on 8 December 2017 – meaning that the Departments of State and Homeland Security were directed to “restrict the entry of nationals of Chad, Iran, Libya, North Korea, Syria, Somalia, Venezuela, and Yemen in order to protect the security and welfare of the United States” – it became clear that a significant proportion of the legitimate refugees on Nauru would no longer even have the option of submitting an application to be considered for resettlement in the United States because of their country of origin. So when another 35 refugees left Nauru for the United States on 18 February 2018, the fact that all were single Afghan, Pakistani or Rohingya men – with one Sri Lankan family and one Bangladeshi refugee – underlined the uncertainty of the future for the largest group of refugees still detained on Nauru … those from Iran who would never be accepted for US resettlement. The 29 people who left Nauru on 4 March 2018 confirmed this. They were two Sri Lankan families, one Rohingyan family, one Afghan family and single men from Sri Lanka, Afghanistan and Pakistan. The Guardian reported that the Refugee Action Coalition (RAC) said it was remarkable there were no Iranian, Somali or Sudanese refugees among those who have left this year, despite Australian Border Force officials denying any particular nationalities were banned from resettling in the US. RAC spokesman Ian Rintoul said US officials were expected to stay on Nauru for another couple of weeks but had not yet scheduled any new vetting interviews for another round of refugees. So for the hundreds of people remaining in detention there, most of whom are restricted US entry based on their countries of origin, hope was clearly waning. When contractors pulled out after sustained human rights campaigns indicating the illegality of the existence and operations of the facility, Peter Dutton moved to shore up the widely condemned and failing policy by engaging a new engineering firm with a lucrative financial incentive. Engineering firm Canstruct are reputed to be accepting an $8 million taxpayer-funded contract to provide everything from security to food and welfare until March 2018, (with a whistleblower indicating that the Immigration Minister wants to see Canstruct operating Nauru for three years.) And with ‘offers’ open to Manus Island detainees to relocate to Nauru i.e. from one prison to another, the Australian government clearly plans to continue with its torturous, illegal offshore detention program. On 31 October 2017, Nick Martin – a senior medical officer deployed on Nauru from November 2016 to August 2017 – spoke out about his experiences on the island prison. As a surgeon lieutenant commander, he served in submarines in the Persian Gulf, took fire in Afghanistan and was deployed in Kosovo and the Balkans. But what he saw in the Australian run detention centre was “more traumatic than anything I’d seen in Afghanistan“. He alleged that patients with breast lumps, kidney stones and neurological damage were delayed diagnostic treatments; and that severely diabetic asylum seekers held within the detention regime are at risk of going blind. His claims are backed by an extensive cache of leaked documents that show that Martin’s views are widely shared by other medical practitioners on Nauru contracted by the Australian government. In one leaked email, dated May 2017, a health services manager on Nauru identified five serious cases where asylum seekers had been waiting for months beyond the medically recommended timeframes without treatment – one asylum seeker had been waiting for 12 months for medical transfer when the recommended treatment time was one month. The manager had noted “All remain symptomatic and some with symptoms worsening,” Dr Martin said that evacuation deadlines set by him and his staff set were frequently “reached and breached” by the Australian Government, which he holds ultimately responsible for the delays. “These medical delays put in place are absolutely criminal,” Dr Martin said. In November 2017, the Guardian reported that some staff at the Nauru detention centre (case managers, sport and recreation staff, and teachers) had been deported from the island in a confusing and sudden apparent end to their employment. Some had been told in an email from a service provider that there is “no longer accommodation available in RPC1 so due to shortage some staff are being flown home temporarily”. The Department of Immigration and Border Protection would only confirm that there was “currently some movement of DIBP and contracted staff between accommodation facilities on Nauru”. There has been no further public information on the staff available since. In January 2018, another harrowing personal story highlighted one of the many damaging aspects of Australia’s offshore processing/detention policy. Read more about this specific situation at this post. Transfer problems are not rare. On five separate occasions since September 2016, and with increasing urgency, doctors have requested that Fatemeh, an Iranian refugee, be moved from Nauru for cardiac checks, having been diagnosed as at “high and imminent risk of … heart attack or sudden death”. However, the Australian Border Force has refused to move her to a hospital that can treat her, because she won’t leave her young son alone on the island. Having fled Iran with her son and being incarcerated on Nauru with him since 2013, they have both been recognised as refugees, but, Dr Nick Martin (previously mentioned) who treated Fatemah during his time on Nauru has condemned the Australian authorities, saying “For the Australian Border Force to use her son as a way of denying treatment is breathtakingly cynical“. After former commissioner of the Australian Border Force, Roman Quaedvlieg (who served in that role from 1 July 2015 until May 2017 ) has his employment terminated after investigations into abuse of power, he began to engage on Twitter. An exchange with Dr Nick Martin in April 2018 (right) led to the Guardian report that Quaedvlieg admitted that the ABF ‘obstructed’ medical transfers from Nauru. Former staff continue to report conditions including toxic mould syndrome, cognitive and neurological symptoms, chronic pain and chest infections as a result of exposure to the mould and the resultant contaminated air in the buildings of the Nauru centre. And yet, a spokesman for the Department of Home Affairs told the Guardian “there have been no cases of anyone developing health issues following exposure to mould at the Nauru RPC”. Both Narges and Daryoush have suffered mentally and physically since the separation. Narges has self-harmed and attempted suicide. As well as physical health issues, both have been diagnosed with severe depression and post-traumatic stress disorder and have been repeatedly recommended for family reunification by the numerous service providers that are paid by the Australian government to take care of them. And in a situation where there has been no Chief Medical Officer for months, the healthcare and advocacy for detainees on Nauru has to be seen as frequently inadequate. They have received multiple knowledgements of receipt of their correspondence but no solutions. One such response from the ABF bluntly told Daryoush to stop contacting them until he can come up with “substantive new issues”. When this family’s situation became public, the Labor Opposition stated that separated refugee families stuck in limbo because of Australian government policy could be reunited if Peter Dutton let them apply for US resettlement from Australia. The Greens’ Immigration spokesperson, Senator Nick McKim called for the family’s immediate reunification in Australia. In March 2018, when Nauru severed an arrangement (in place since 1976) to have the High Court of Australia as the final appellate court for Nauru, legal experts spoke out about concerns for those people who had come to seek asylum in Australia and been sent to Nauru. If their right of appeal to the high court over their refugee status is taken away, then vulnerable people are left on an island prison with virtually no rights. With appeals to the high court from Nauru more than doubling in the past year, this leaves those from whom so much power has already been stripped with no redress. Human rights lawyer George Newhouse called on the foreign affairs minister, Julie Bishop, to address the issue, calling it a “constitutional crisis”. In the last week of August, they moved asylum seekers out of regional processing centre 3 (RPC-3) and demolished the tents. At least 100 people have continued to live in RPC-3 since the facility was deemed “open” i.e. allowing freedom of movement to detainees three years ago. The Guardian reported that “island sources and advocates say the move is to ensure there are no children living in tents behind the camp fences when foreign leaders and visitors arrive, given previous requests from families to move have repeatedly and recently been rejected by centre authorities” and that refugees working at a local hotel had been stood down from work so they wouldn’t have incidental contact with visiting leaders. The Nauruan government took steps to avoid scrutiny of the Australian-run centres during the forum. Although they temporarily set aside the $8,000 cost for media visas, they limited the number of media spots available, purportedly due to accommodation issues and specifically banned the ABC from attending. The Guardian formally applied for a visa but was rejected. Nauru’s government also released statements urging attending journalists to focus on the forum and “not engage in activities that cause or encourage disruption or civil unrest”. Nauru’s “unlawful assembly” law was highly policed to prevent protests by refugees and new laws prohibited any disrespectful behaviour to the country. The ‘unlawful assembly’ law prohibits people gathering in groups of three or more where “the assembly … would cause a reasonable person to fear … unlawful violence against people or property”. It has been used arbitrarily to break up protests by refugees on the islands, and even to stop parliamentarians leading demonstrations. In addition, recently introduced laws make it an offence, punishable by up to five years’ jail, to show disrespect to the Nauruan flag, emblem or anthem. All of this made the daily existence even more difficult for innocent people who are forced to endure ongoing detention with no clear future and no method of changing their circumstances in any way. It’s clear then, that the cruel nature of the punitive approach by successive Australian governments is not just inhumane, financially and logically unsound, but that it contravenes the country’s obligations as a signatory of 1951 Convention and 1967 Protocol. As outlined on the ‘Read’ page, the offshore detention policy is so widely and unequivocally condemned that 17 of the world’s leading human rights lawyers have put an extensive and scathing submission to the International Criminal Court (ICC) clearly entitled “The situation in Nauru and Manus Island: Liability for Crimes Against Humanity in the Detention of Refugees and Asylum Seekers”. But the incriminating legal document has not halted the Australian government’s approach. Deaths, child abuse, mental torment … nothing seems to make the impact that it should on any human being, let alone those who have obligations and responsibilities to protect vulnerable people and to respond to the voices of the people who voted them into office.